without the freedom to choose drugs not yet approved by the FDA. The Free To Choose Medicine plan would empower patients, advised by their doctors, to make informed decisions about whether to use approved drugs or new drugs in late stage clinical testing. Join the Fight for patients’ rights. Tell Congress and the FDA that overhaul and reform are needed now and to support Free to Choose Medicine! Why Free to Choose Medicine? People are suffering and dying because they are denied timely access to new drugs stuck in the FDA new drug approval pipeline. Lower health care costs, as new drugs come to market faster and at lower prices. Healthier, longer, more productive lives for ourselves and our families. The purpose of the drugs-to-patients system should be to deliver better drugs, sooner, at lower cost, not to chase after the impossible goal of zero risk. The Free to Choose Medicine plan does not eliminate the role of the FDA in the drug approval process. A drug company can opt to remain within the current approval process for any of its drugs. FTCM sets up a competing system that would allow manufacturers to market new drugs after completion of the FDA’s Phase I testing and at least one round of Phase II testing, contingent upon certification of a FTCM Committee that the drug successfully completed that testing. The drug could then be made available to patients and, based on the real-world, observational data collected from patient usage, the company could seek Observational Approval from the FDA to market the drug to the general public. The FTCM system of patients use, usage monitoring and reporting and FDA observational approval, would bring drugs to market faster, at reduced prices and encourage expansion of companies seeking to develop, test and market new drugs. The U.S. drugs-to-patients system fails to achieve its overall system goal of better drugs, sooner, at lower cost. The key constraint that impedes achieving this goal is the FDA’s enormously expensive and time consuming clinical testing process. 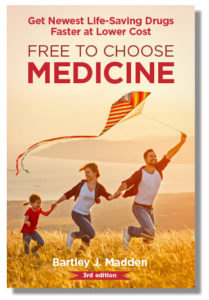 Free To Choose Medicine would empower patients, advised by their doctors, to make informed decisions about whether to use approved drugs or new drugs in late stage clinical testing. This third edition of Bartley J. Madden’s book Free To Choose Medicine describes how we can achieve a defining moment for America—a directional change from today’s trend of increasing litigation and regulation as well as a stake in the ground anchoring the undeniable truth that control of medical decisions belongs, first and foremost, with individual patients and doctors, not the government.